Nine-years-old Bruno has a lot of things on his mind. Who is the Fury? Why did he make them leave their nice home in Berlin to go to 'Out-With'? And who are all the sad people in striped pyjamas on the other side of the fence? The grown-ups won't explain so Bruno decides there is... read full description below. 'Something's are just sitting there, minding their own business and waiting to be discovered. Like America. And other things are probably better off left alone' Nine-years-old Bruno has a lot of things on his mind. Who is the 'Fury'? Why did he make them leave their nice home in Berlin to go to 'Out-With'? And who are all the sad people in striped pyjamas on the other side of the fence? The grown-ups won't explain so Bruno decides there is only one thing for it - he will have to explore this place alone. What he discovers is a new friend. A boy with the very same birthday. 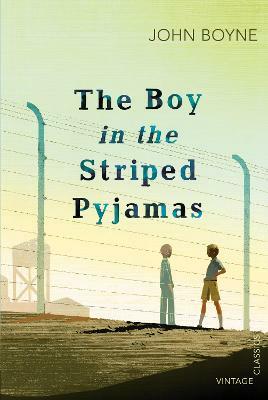 A boy in striped pyjamas. But why can't they ever play together? Some things are just sitting there, minding their own business, waiting to be discovered. Like America. And other things are probably better off left alone'. Nine-year-old Bruno has a lot of things on his mind. Who is the 'Fury'? Why did he make them leave their nice home in Berlin to go to 'Out-With' ? And who are all the sad people in striped pyjamas on the other side of the fence? The grown-ups won't explain so Bruno decides there is only one thing for it - he will have to explore this place alone. What he discovers is a new friend. A boy with the very same birthday. 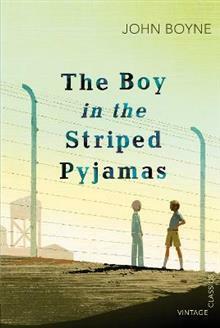 A boy in striped pyjamas. But why can't they ever play together? BACKSTORY: Read an interview with the author JOHN BOYNE and learn all about the Second World War in Germany.